Get ink-spired as you browse through these tattoo galleries and discover the meaning behind popular iconography. Learn what to consider before you select your body art and artist, and how to properly care for your tattoo or piercing. 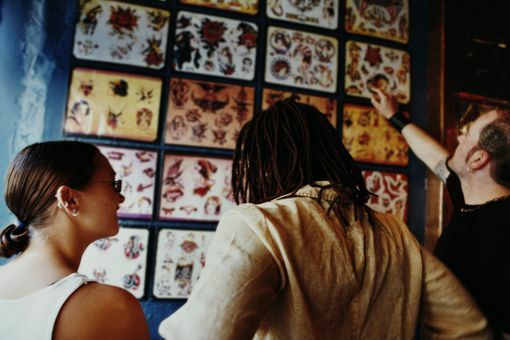 How Much Should Your Tattoo Cost? Do Tattoos and MRI Scans Interact? Tattoos: How Much Do They Really Hurt? Is it Wise to Get Someone's Name Tattooed on You? Do Piercings Set Off Metal Detectors? Will A Healing Tattoo Leak Fluid? How Long Do I Have to Wait To Go Swimming After Getting a Tattoo? Is a Scabbing Tattoo a Sign of Healing? What Does it Mean When a Dandelion Tattoo Turns into a Feather Tattoo and Birds? What is a Keloid and What Can be Done if You Have One?